Panthers have made strides in their debut season in the All About Netball League in Fareham. 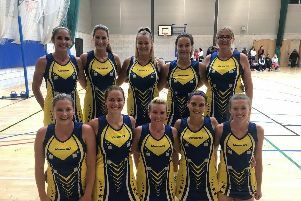 Captain Louise Hampton has gathered some experienced players and added a few Back to Netball graduates – to produce a combination of old and new skills. A space in division three meant they have jumped straight into the thick of the action. But with two wins from three games so far, Panthers have not looked out of place. Their latest outing ended with a 21-14 win over Cams Cyclones. Good shooting by goal-attack Natasha Rogers was supported by Hampton in mid-court. But it was goal-keeper Amy Green who really shone. Making some great interceptions and turning over a raft of rebounds, Green was voted best and fairest player. Also in division three, Cams Confusion had a good game against Devils – recording a 24-13 win. After a slow first quarter they really applied the pressure and kept pulling away. Devils’ versatile captain Hannah Early found herself playing in many different positions throughout the game and managed to keep the team pushing hard enough to collect a halfway score point. In division four, Cams Crystals beat Portsmouth Pivotals 20-13. They trailed by five in the third quarter but soon made their move. Crystals lefts their rivals standing to open up an 11-goal lead going into the final quarter. Pivotals reacted but it was too little, too late. Newcomers Fareham Foxes continue to improve – despite a 29-10 defeat to Phoenix last time out. In division one, Rachel Martin was the star player as table-toppers Vixens beat Avengers 31 -12. Susie Lees was the Avengers player of the match. Netstars also had a big win against a very disappointed Warriors who could not get into their stride at all. Goal-shooter Anna Harvey struggled for possession as Netstars defended well and held off any set play by Warriors to get to goal. Netstars ran out 33-7 winners in the final reckoning. Westowen and Cams Chaos shared a well-matched contest – going to goal from most centre passes. It was in the final quarter Westowen upped a gear to increase their lead – ultimately running out 43-31 winners. Fireflys Bronze and Swanmore had a close game. Swanmore just lost their grip at the crunch time – slipping to a 20-19 defeat in the final quarter. In division two, VS beat Estee Elite by one goal (11-10). Tornadoes had a cracking clash with Digits – winning 30-17. Knowle beat Karadents 25-14 with Angie Carpenter voted players’ player.